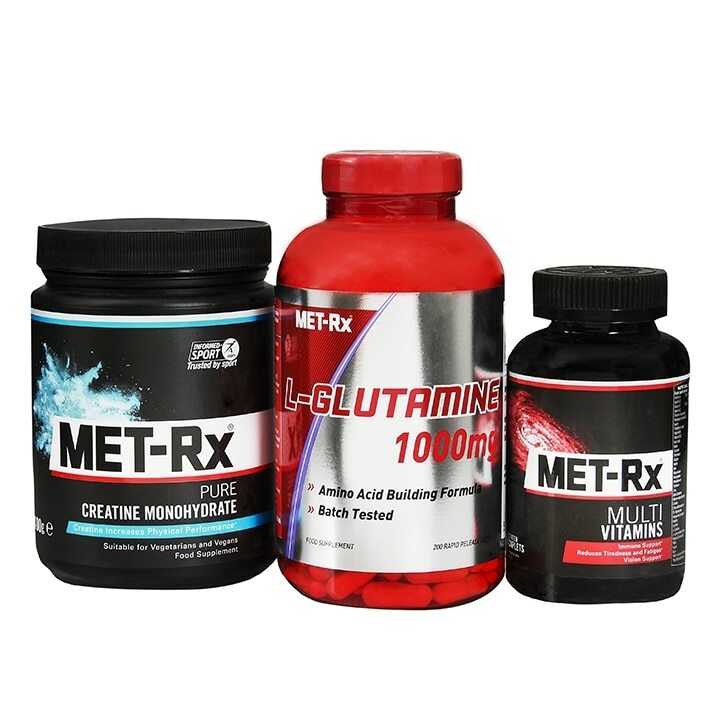 Our stack of three popular supplements combine ingredients including Creatine Monohydrate to help enhance the body's overall training capability, Timed Release Multi-Vitamins for general health and wellness, and L-Glutamine to help aid recovery and maintain cellular health. Blend one heaped teaspoonful (one serving (5g)) with 300ml of water or juice. For best results, use an electric blender and once mixed the product should be consumed within 20 minutes. Do not exceed stated dose. Ensure adequate hydration during and after training - Minimum of six to eight glasses of water daily. For optimum results, take as follows: Phase 1 (Loading): Drink one serving 4 times daily (if less than 86kg), 5 times daily (86 - 100kg) or 6 times daily (100 plus kg); for five days only. Phase 2 (Maintenance): Drink one serving daily (all weights) for eleven weeks. Phase 3 (Rest Period): No creatine supplementation for four weeks. The above three phases can then be repeated. Take one caplet daily, preferably with a meal. This formula provides the benefits of its ingredients over a prolonged period of time. Do not exceed stated dose. For adults, take two (2) capsules twice daily, preferably before and after your workout. Do not exceed stated dose. Ensure adequate hydration during and after training - Minimum of six to eight glasses of water daily. Emulsifier (Acacia Gum), Sucrose, Rutin Powder, Vitamin A (as Retinyl Acetate), L-Cysteine Hydrochloride, Papain Powder, Folic Acid, Chromium Picolinate, Potassium Iodide, Sodium Molybdate, Biotin (as d-Biotin), Tricalcium Phosphate, L-Selenomethionine, Vitamin B12 (as Cyanocobalamin), Vitamin D3. L-Glutamine, Capsule Shell (Gelatine), Anti-Caking Agents (Magnesium Stearate, Silicon Dioxide).